This project, entitled “Candied Candlelight,” is a perfect extra gift for the teacher or babysitter; it doesn’t take much time to assemble, yet it has simple appeal and practical purpose. Caution: Never leave a burning candle unattended. 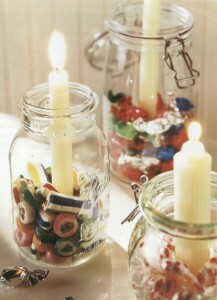 Canning jars display a playful glow when holding a white taper candle nestled in holiday candy. 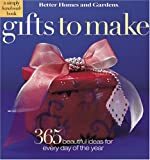 Gifts to Make : 365 Beautifully Easy Ideas, (Simply Handmade), by Better Homes and Gardens; a beautiful collection of easy handmade gifts for every occasion through the year. For a delightful presentation, place a clear cellophane bag in the jar. Fill the bag halfway with wrapped or unwrapped candles and secure with a twist tie. Use raffia to tie a candle to the outside of the jar. Variations: Fill the mason jar with pretty candies that represent the season: jelly beans or little eggs for Easter; candy corn or orange and black jelly beans for Halloween; cinnamon hearts for Valentines’ Day, or green candies for St. Patrick’s Day. The candles too can be plain white, or colors representative of the occasion.This candle craft is very easy to put together for any special day or season.